If the shoulder-to-shoulder crowds inside Activision's E3 booth were any indication, the Call of Duty series is still a huge deal. The good news is that I was able to slip away from the mob for a closer look at two single-player missions in Call of Duty: Modern Warfare 3. The bad news is that the entire demo was hands-off. As if the obliteration of Washington, D.C., wasn't shocking enough in Modern Warfare 2, Activision's Infinity Ward studio is destroying New York City in Modern Warfare 3. In a carefully-orchestrated set piece, players emerge from a submarine strike to see the Big Apple in flames, juxtaposed against a beautiful, partly cloudy day. And once again, the Russians are to blame. The days when Call of Duty was a straightforward military shooter are getting harder to remember with each new addition to the series. 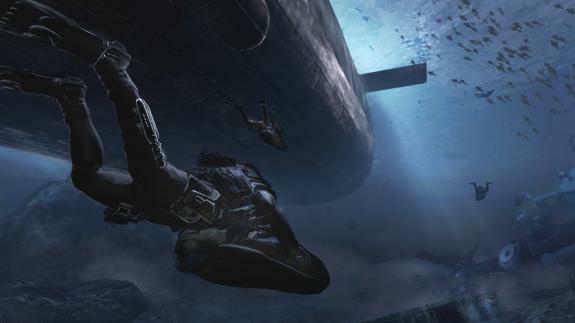 In one single-player mission, players escape the wreckage of New York City by motor boat, weaving between explosions galore from nearby battleships and aircraft carriers. In another mission, players pursue a subway full of enemies by pickup truck, gunning them down from a parallel set of train tracks. If you cast aside the fancy military jargon scattered throughout the game, Modern Warfare has essentially become a James Bond movie. I felt my eyes glazing over each time the demonstrator slipped into straightforward shooting action. These sections will certainly be more fun to play than they are to watch, but they all seem so familiar -- the sprinting through scattered shelter, the blind firing at clusters of enemies, the occasional slow-motion surprise attack on a roomful of foes -- and I wonder if it's starting to get stale. Competitive multiplayer is under wraps for now. Sort of. Activision was not showing or talking about Modern Warfare 3's competitive multiplayer at E3. But last month, Kotaku leaked a trove of data on the game's online component, including a map list and killstreak details. Still, Modern Warfare 3's multiplayer details may be changed before the game's November 8 launch, so don't count on everything you read about to be part of the final product.